As a beer drinker and a home brewer I am always looking for good quality beer and ingredients. I think it is important to support local farmers and industries so that our businesses in our province can thrive and be successfully. I’m a huge supporter of local farms and buy from them as often as I can. So when I heard that there was a hop farm just outside the perimeter I had to check it out. Sandra Gowan and Paul Ebbinghaus started Prairie Gem Hops and have been growing in Manitoba since 2009. Sandra was a gardener and grew a variety of vegetables and plants and was always interested in pushing the limits of what can be grown in the Manitoba climate. After reading an article about the hop shortage she decided to begin researching hop growing and eventually decided to give it a try. Her and her husband started with 3 varieties of hops to see how they would fair. 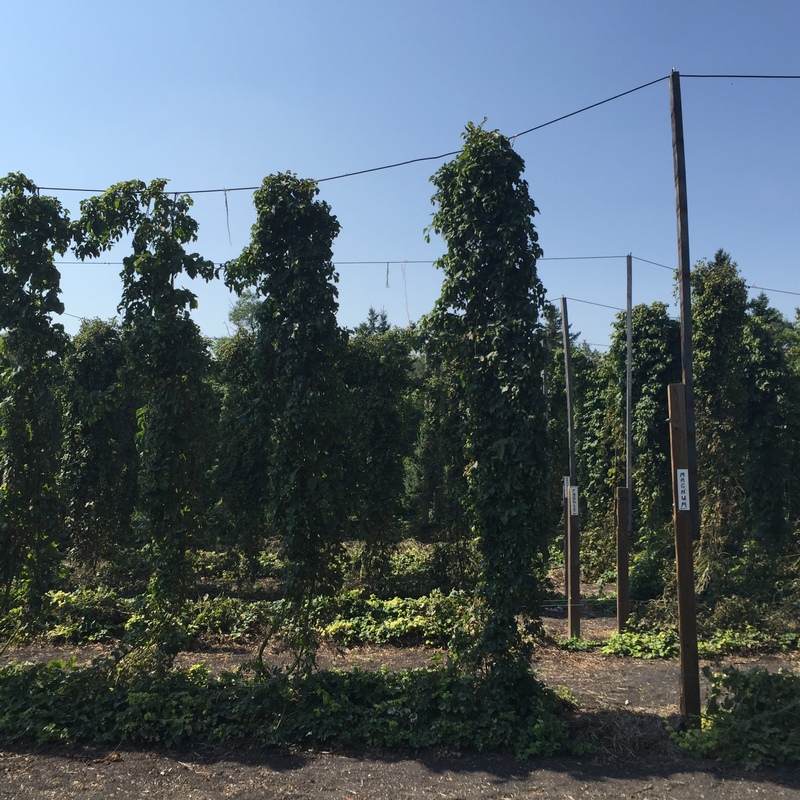 After a successful grow season they started adding varieties, moving to 12 and eventually to 18 different hop varieties. As well as a spin on a native hop (Brewers Gold) she produces many others including chinook, nugget, centennial, galena, sterling, cascade and Willamette. All this is grown on a ¼ acres of farm land. While Sandra has 225 plants, producing hops is a little bit like making maple syrup. You need more than you get. From 5lbs of hops Sandra will produce 1lb of dried hops for sale. Last year Sandra produced 280lbs of dried hops from her 225 plants. Prairie Gem Hops does their best to grow their plants as safely as possible. They don’t use any chemicals and focus on composted fertilizer to provide the nutrients her plants need. This becomes a challenge when fighting bugs, but Sandra wants to make sure her product is grown in the safest way possible and is willing to deal with them naturally. 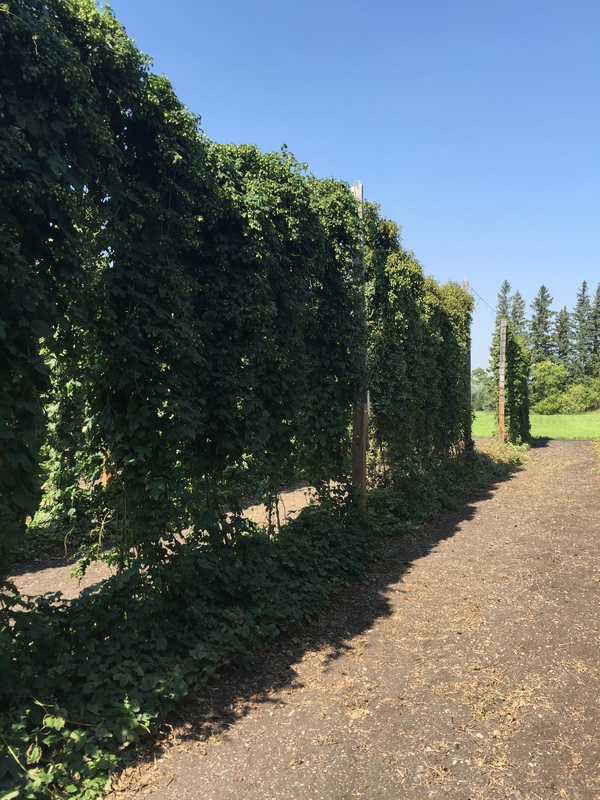 The hops that are produced at Prairie Gem Hops are used not only in commercial beers, selling to breweries like Fort Garry, but also for the home brewer market. Sandra sells to Grape and Grain as well as Hop and Vine and is willing to sell directly to home brewers. 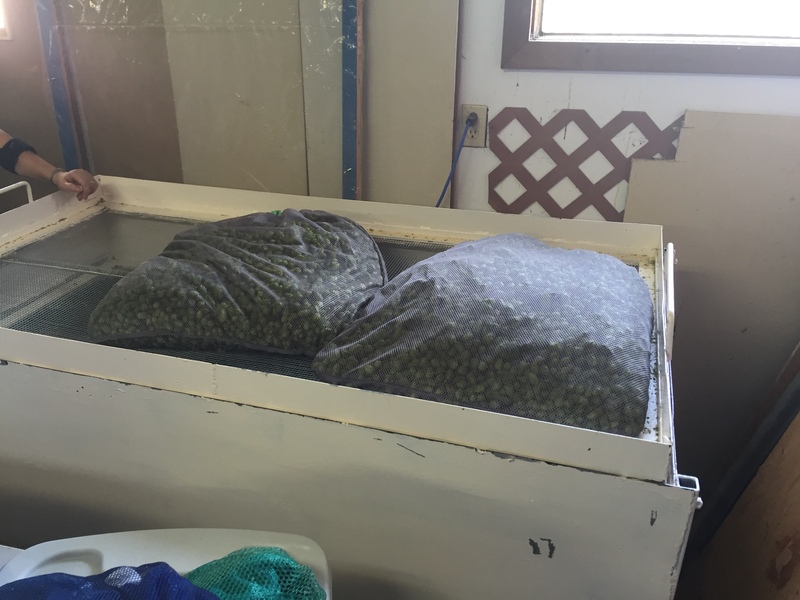 Prairie Gem is harvesting now and this is the perfect time to be looking at buying hops. 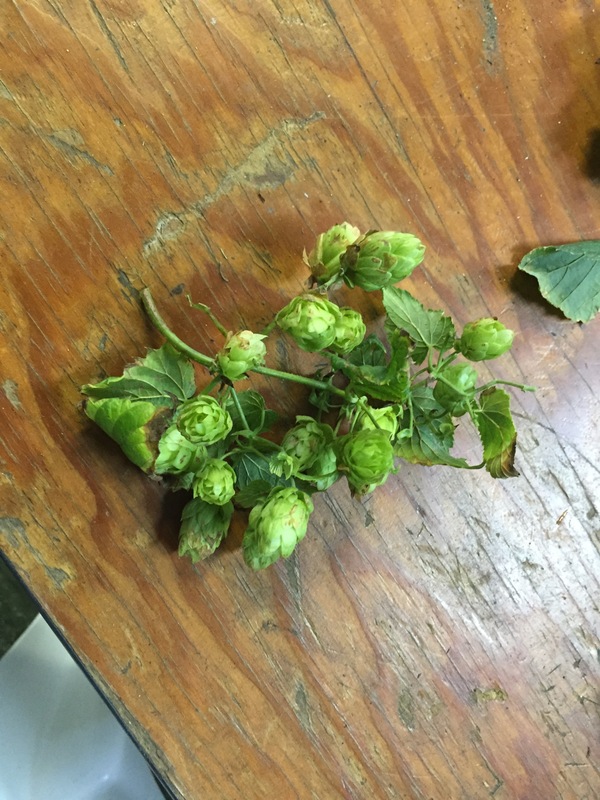 Sandra is willing to accommodate brewers who are looking to make a fresh (wet) hopped beer with fresh local hops as well. This is also a great time to be growing hops in Manitoba due to the growth in the craft beer. With all the breweries looking to open there is also the hope that they will be trying local producers to meet their brewing needs. Sandra’s farm is fantastic. She is passionate about growing hops and has a fantastic product. While there are a number of producers of hops to choose from, supporting local businesses is really important for me, it’s why I focus on local beer and breweries. I’ve talked about how the brewing industry is incredibly supportive of new breweries opening their doors and I only hope that these same breweries will start to look local when brewing beer. I know that I’ll be using Sandra’s chinook hops for my next home brew and I hope others will do the same.